Asia now accounts for a dominant 60% of seaborne trade, and has plenty of potential to grow, according to statistics provided by the world’s most famous shipping analyst, Dr Martin Stopford. The president of Clarkson Research was speaking at Nor-Shipping’s first Asia focused seminar on Wednesday, where he described the continent as the “centre of maritime trade”, its 60% share of seaborne trade equating to 6bn tonnes a year. Stopford said that China was not the whole story, and that the continent as a whole was a “collage of development”. 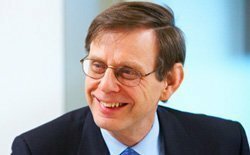 Stopford said that greater port infrastructure was needed in the region, especially in Southeast and South Asia, and if done right would be very profitable. Asia has still much more potential, the Clarkson executive stressed, pointing out that the average per ton per capita moved by sea in Asia is less than half of the OECD population. With China pushing its influence in the region more and more to the chagrin of the United States, Stopford warned that this might lead to trouble, not that shipowners would be affected, he posited. “The history of shipping is doing business with people who don’t get on with each other,” he said, concluding that shipowners are smarter than just about everyone else.